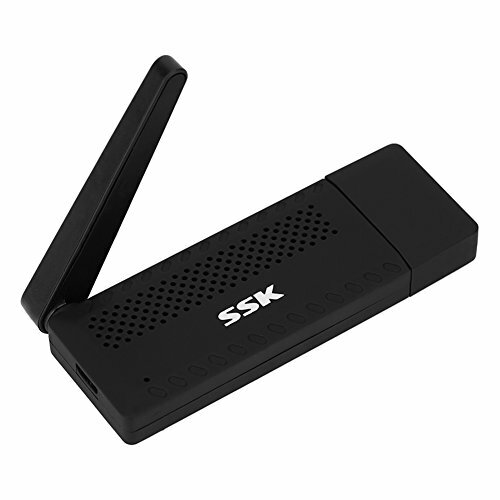 This wifi display dongle supports 2 modes: Miracast and Airplay, it can cast multimedia (images, audio, video) from your smart phone/tablet to large screen TV, monitor or projector via WiFi connection. Made of ABS material, non-toxic and durable. Small and lightweight, easy for carry. Perfect for business presentations, training teaching, home entertainment, games. Our products have 100% satisfaction guarantee, if you are not satisfied with your purchase for any reason, please feel free to contact us. [Fluent and fast streaming]:Has stable signal transmission and high resolution, you can enjoy fluent and fast streaming with max. 1080p resolution within 10m. [Good compatibility]:Support for iOS 7.0 and above, Mac OS, Android 4.4 and above, Windows 8.1 and above OS. [1080p resolution]:1080p resolution within 10m, you can share high resolution media with your friends and families easily. [Practible and durable]:Made of ABS material, non-toxic and durable. [Easy setup]:Plug into HDTV and connect to your home WiFi network. No additional power supply needed.